I have spent most of my life as an avid photographer, from my early days with a Kodak Instamatic camera to today where my 'best friends' are a Canon 50D and a Canon 7d Mark II (digital SLRs). Far from professionally trained, I learned my craft through trial and error, watching tutorials, or taking direction from other seasoned and accomplished artists/photographers. Every day I learn something new to add to my knowledge base. Even from my early days, my main subjects were those of nature - the local squirrels, raccoon, flowers and butterflies - larger subjects for the then limited equipment and skill set. Today, I've advanced as a wildlife photographer - from large creatures to small bugs that require a steady hand and a macro lens. With a wide variety of wild things to photo, I'm never short on subjects. I was not the little girl playing with dolls! Give me dinosaurs and the outdoors!! With a deep affection for the huge prehistoric reptiles, I'd spend hours with kids' modeling clay building my own beasts to admire and play with. I'd draw them and daydream of being a famous paleontologist. I can look back at the very first contest I ever entered run through the Yale Peabody Museum - a contest to honor their flagship skeleton - a huge "Brontosaurus" that was later renamed Apatosaurus - and given his true head! As research went on, it was found that the then big Bronto was sporting the wrong skull! In honor of the correction, several area artists both young and old entered a contest for their best drawing. I won an honorable mention with my crayon drawing! Boredom was not a part of my vocabulary. There was always something to do. Coloring books with Crayola crayons were always at hand or pencils for sketching. I was definitely one of those kids that doodled on her notes at times in class! During summers, I could spend all day outside hunting the yard for a wide variety of critters and make no matter if they be insects, reptiles or mammals, or I'd be dabbling as a crafter either inside with Grandma or outside on an old metal TV table. I used to sew my own stuffed animals and wall hangings and learned to knit my own scarves. My aunt showed me one simple stitch in crocheting and I would make stable blankets for my Breyer horses! One fond memory I have is of my grandmother and I working on a bean bag frog using fabric scraps and old dried beans for stuffing. I was always highly enthusiastic in any art class during my school years - no matter if it be drawing, paper cutting, sculpting, or anything else that allowed me to use my hands and my imagination. I have been honored to have my images be included on the front cover of The Shoreline Times, inside the New Haven Register, Branford Land Trust newsletters and are currently being used as design elements for greeting cards and other gift items like calendars, tee shirts, and pendants. I am most proud of having been able to volunteer with the Branford Land Trust's Osprey Observaton Team in observing and documenting breeding success of area Ospreys. I helped assemble three photographic displays along with fellow wildlife watcher, Diane Hull. 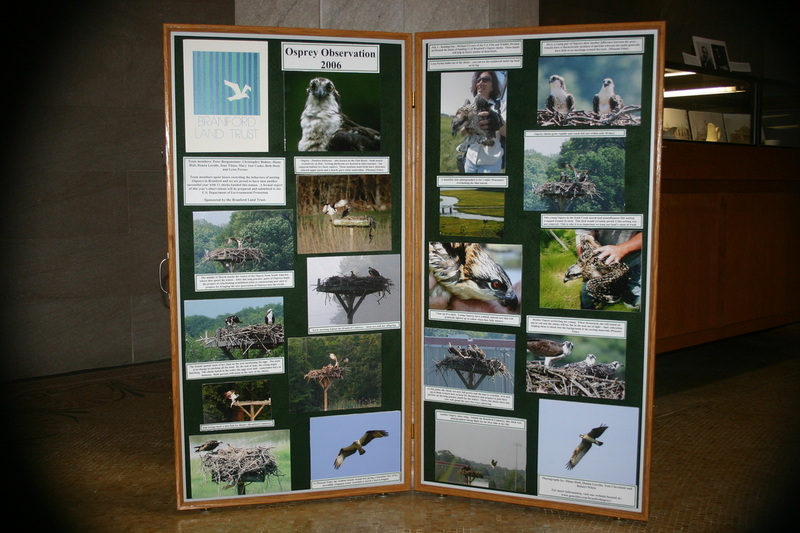 We compiled some of our best osprey and bald eagle images for two traveling displays sponsored by the Branford Land Trust. These displays were viewed by visitors at the two town libraries and were used during educational talks at area schools. I also assembled a third display on my own about horseshoe crabs in conjunction with the BLT's participation in Project Limulus - a program of volunteers that take part in the census and tagging of horseshoe crabs with Sacred Heart Academy professors. Sarah Rose "Tiny" painted on commission. Despite a deep love of ancient animals, I do love all creatures great and small. 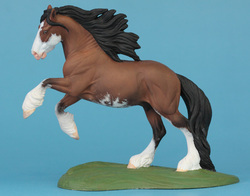 I've held a long time admiration for horses and spent the last thirty plus years collecting Breyer horses and over the last twenty taking models and custom painting them. Some even have real hair added! I've made a whole business around taking commissions, sometimes painting the likenesses of a real horse a customer might own or have owned. In the hobby show ring, my work has done well earning championship and reserve championship status for lots of happy owners. As a painting artist of all things resin, plastic, or otherwise, the most touching thing I can place as incredibly dear to me to engage in has been lending my talent to the 500 Frogs Project. 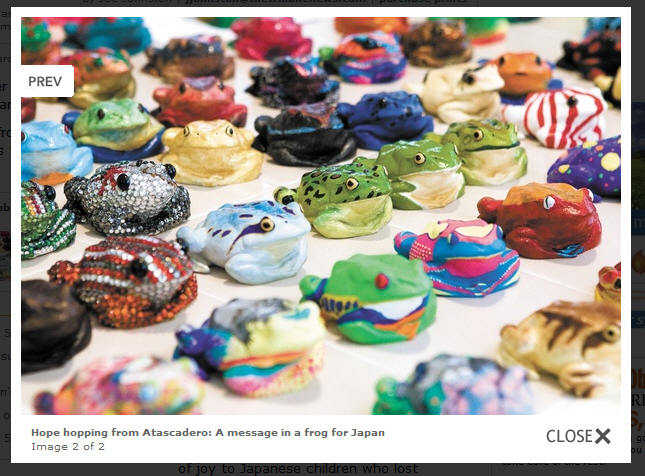 The brain child of Deb Buckler, artists and crafters both young and old the world over painted copies of a frog sculpted by her ultra-talented husband, Randy, who share a resin casting business together. I had the honor of painting several copies - some of which are included in the image to the left (center row, the blue, green spotted, green, and the green with the mustache, and in the front row the gold and brown). Why frogs? After the tsunami that devastated Japan's coastline, Deb was heartsick over the tragedy and had a driving urge to do something as a show of kindness, love and support for the survivors. Frogs in Japanese culture are considered signs of good luck and good fortune. Therefore, many artists, school children, and other folks lent their talents to decorating frogs Deb and Randy cast. Although the project is completed, there is a warmth I continue to hold deep within knowing I was able to be a part of this project along with fellow artists and crafters to able to bring smiles to the faces of many of the survivors. As an artist, I will never forget this project. As if this wasn't enough, I can be found taking time playing with digital manipulation and fractal programs like Fotosketcher, Fractal Explorer, Apophysis and Mandlebrot 3d. Again, I could get lost in these programs looking deep into the various fractals for interesting designs and geometric formations that would result from applying a number functions or seeing how applying different filters affects and changes my images. Overall, one never knows what I might be doing at any one time. My creative juices tend to run in a wide variety of paths and when I feel inspired, I need to go with it.